Last month my dear friend, Dara Beevas from Wise Ink Publishing and I headed out west to California to work on a Carpe Diem writing project I’ve been trying to complete for 3 years. 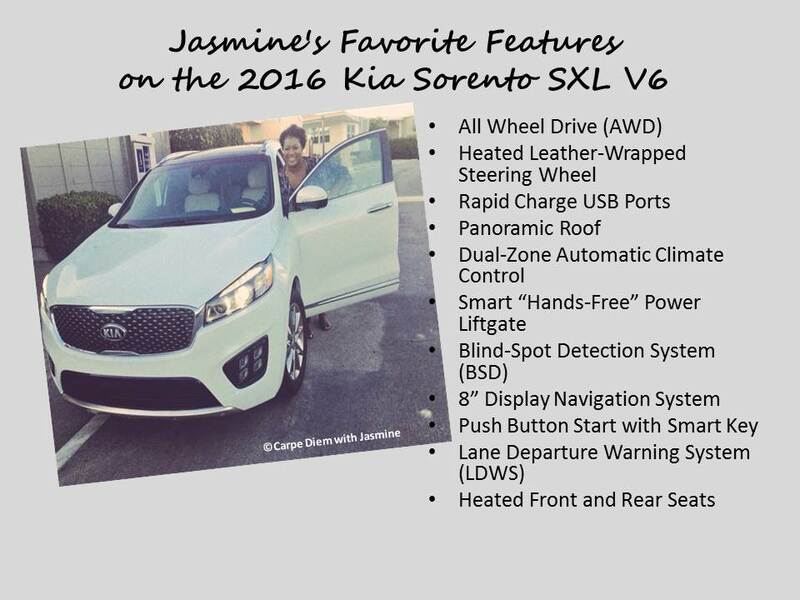 During our time in California, my friends at Kia let me use a brand new 2016 Kia Sorento SXL V6 in exchange for an HONEST review on Carpe Diem with Jasmine. I must admit that before driving the 2016 Kia Sorento SXL V6 I had very limited knowledge about the brand. I have an aunt with an older Kia Sorento that has had nothing but good things to say about her car and on trips to Tuskegee to visit my Aunt Sarah at Christmas time I’ve passed by the Kia plant in West Point, GA driving on Interstate 85. 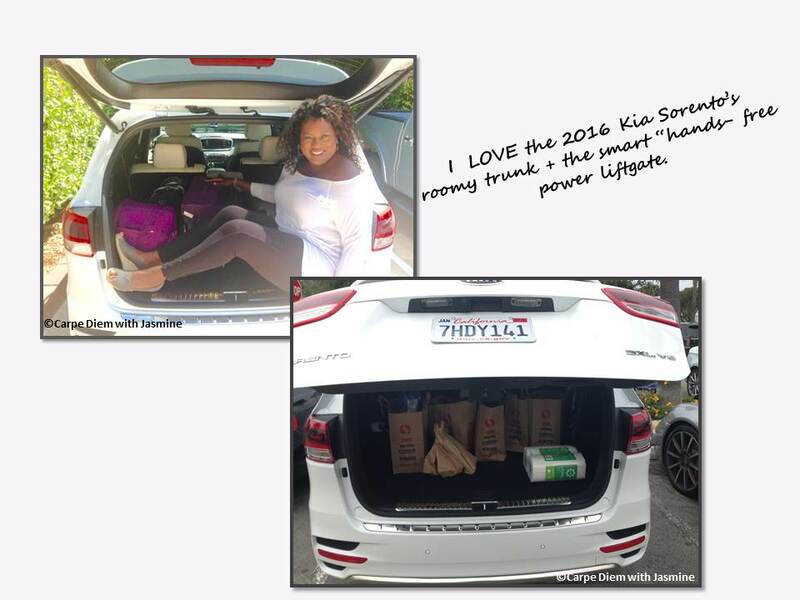 I really enjoyed driving the 2016 Kia Sorento SXL V6 during my time in California. The midsize vehicle was completely redesigned for 2016, and I found the car to be EXTREMELY spacious for those in the front and back seats. The trunk can be converted to a 3rd row providing two additional passenger seats if needed and it offers plenty of room for luggage, sporting equipment, groceries, strollers and other items. The 2016 Kia Sorento SXL V6 is a very solid car. Despite its size, I found it be very agile and easy to maneuver. I felt completely safe while driving the vehicle. My sense of safety may have stemmed from the safety features like- dual front advanced airbags, front seat-mounted side airbags, side curtain airbags for the 1st and 2nd row of seats, a Blind-Spot Detection System (BSD) and Lane Departure Warning System (LDWS). In addition to being roomy and safe the 2016 Kia Sorento SXL V6 has an 8-inch Voice-Command navigation system with an AM/FM/CD/MP3/SiriusXM® Audio System; BLUETOOTH® wireless technology hands-free connectivity and steering-wheel-mounted audio buttons. 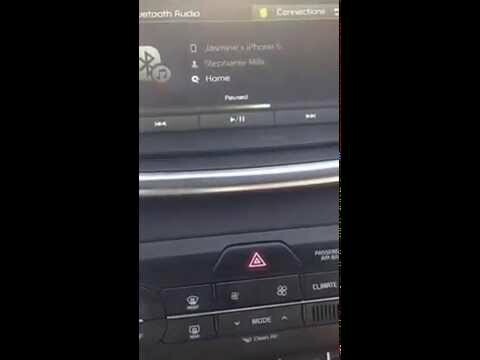 I enjoyed being able to listen to my favorite playlist while driving and the voice commands were easy to master. My list of favorites summarizes all of the features I enjoyed in 2016 Kia Sorento SXL V6. If you’re in the market for a new car or mid-sized SUV, I recommend adding the 2016 Kia Sorento to your list of cars to research. The entry point for a 2016 Kia Sorento is $24,900, and you can get a fully loaded V6 model similar to the one I drove for $46,695. I believe it’s important to have safe, comfortable, reliable and stylish transportation as we strive to seize the day!